Free plywood multi chine sailboat plans. Trailerable family T800 class sailboat design for amateur boatbuilders. Published in "Power & Sail Boats" magazine. Designed by Albert Nazarov, Maxim Kovalyov, Dmitry Dolinsky. Web Site Snapshot: If available, above is a snapshot of the Kavalier 800 web site at http://www.boatdesign.net/nyd/K800/ as it appeared when this site was added to the directory or last verified. Please Note that Boat Design Net has no involvement with the above web site; all content and images depicted in the above thumbnail are the property and copyright of Kavalier 800 unless otherwise noted on that site. Description: Free plywood multi chine sailboat plans. 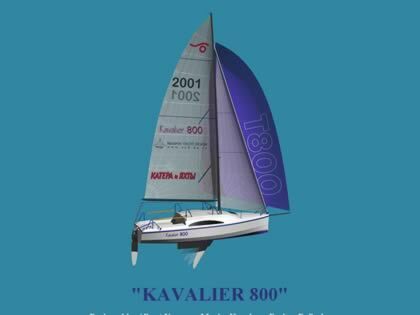 Trailerable family T800 class sailboat design for amateur boatbuilders. Published in "Power & Sail Boats" magazine. Designed by Albert Nazarov, Maxim Kovalyov, Dmitry Dolinsky.